A handshake is the one move that showcases power and dominance, and with just seven seconds to impress, it’s the one thing you can master to ensure that you always come up (T)rumps! Donald Trump and Vladimir Putin recently exchanged a handshake that was analysed by world experts. What tips can we learn from their encounter? Handshakes can be practically tricky, especially if you are concentrating on holding a folder or glass – as can be the case at work-related events. Ensure that you keep your dominant hand free, keep glasses to tables where possible and get rid of those pockets, as hidden hands make you look less approachable. It was President Trump who initiated both handshakes with President Putin at the G20, and by initiating he made it clear that he was in control of the situation. While this might work in politics, if you’re attending a job interview or suchlike, mirroring the executives approach is more likely to earn you brownie points than trying to overpower them. Handshakes tend to be quite individual, hence why such a level of detail about a person can be deduced by a simple shake, but there are a few tips to ensure success. First, make sure you keep your palm flat and fingers outstretched. If you cup your fingers it tends to place them in the other person’s palm, which can feel a bit strange. Then try and wrap your fingers so they’re almost around your colleague’s hand, with the index finger almost on their pulse. Now that you’ve established a good grip use your thumb to create a lock and squeeze firmly, but don’t crush. A good tip is to return the pressure of your partner and then shake two to three times before releasing. Make sure to shake from your elbow and not your wrist. And – of course – for people you know, you can adjust the amount of control and length of the handshake before stepping back. If someone walks towards you with their palm outstretched, you may feel coerced into a handshake, and therefore vulnerable. Try a two-hand grasp instead. By slowing the handshake down and exchanging a verbal welcome, you become the one in charge, deciding when to break your grip and let go of the hand. When standing always outstretch your palm sideways, this puts your grip on an equal footing with your colleague, so whether you’re applying for your first junior job, or you’re the CEO, you can be judged solely on the grip and firmness of your handshake. When sitting down it’s easier to outstretch your hand with your palm facing upwards, as you would offer a dance partner. This is a good technique to use when you’re unsure whether they will return the handshake – after all, it is very hard to resist an outstretched hand. However, it means that the power play is in their hands, as it is easier for them to break the handshake first. This might appeal to the more nervous handshaker, and it was President Trump’s technique at the G20. 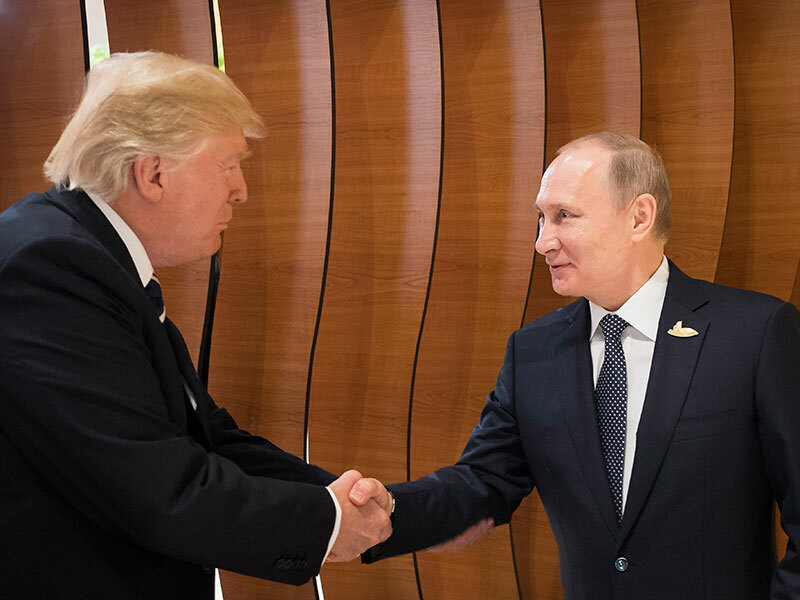 Although Putin didn’t look pleased, he obliged for a few seconds before removing his own hand, leaving Trump with his palm outstretched, but victorious. This is Trumps signature move, which has seen him wagging the arm of everyone from Hilary Clinton to the UK’s own Prime Minister, Theresa May. By clasping the hand in a firm grip there is nothing the recipient can do but ride the wave. This limp and lifeless hand can ruin even the firmest hand shake, and there is no recovery, only the option to drop and move on. The benefits of keeping both hands free is that you can offer a quick touch of the elbow or a hand between the shoulder blades if you’re escorting a companion, but this does give opportunities to rigorous patting opportunities as President Putin found himself on the receiving end at the G20. Unfortunately, there is no way to disable it, except to offer to grab a drink and put the vacant hand to good use! While you’re doing all this, make sure your feet are firmly planted as you face your colleague, and slightly lean towards them. This then gives you the opportunity to step backwards if the handshake goes on for too long. Establishing eye contact while shaking hands conveys power and passion, if your handshake doesn’t extend to the eyes then you haven’t fully delivered. Finally, a cool handshake or a fist bump might be a conversation starter, but ensure it’s only with entrusted colleagues or for effect. Otherwise the only reaction is bafflement which lowers your own power considerably. When in doubt, don’t.